Ordering FAQ - City Mix Inc. When ordering ready mix concrete, there are a number of variables that need to be considered. 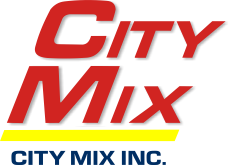 City Mix’s knowledgeable staff will ensure that you receive the best product and the best service for your specific application. In order for us to be able to successfully determine your needs, there are a few things that we need to know. How pliable you would like the concrete to be? What kind of cement is required? What size of aggregate? Approximately, how long you will take to unload our truck? And finally, when is the concrete required? Sidewalk, basement floor, garage floor, grade beam, driveway, piles, etc. The pliable qualities of concrete is measured in slump, most residential work is ordered at a 100mm slump. As a general rule, if the concrete is indoors ( ie. a basement floor), air entrainment is not required. If the concrete is outdoors (ie. a driveway), air entrainment is required. Accelerator shortens the initial set time so that the concrete finisher can start the process earlier. This product is often used in colder weather. Accelerator can be ordered in either one or two percent. The standard size of stone used is 20mm. However, for a small additional fee you can request either 14mm or 10mm stone. Higher sulfate resistant (HS). Most applications require GU, while only applications such as piles require HSR. When ordering concrete it is not uncommon to need multiple trucks. The estimated time allows us to coordinate when to ship out the next truck(s). We require a minimum of one day’s notice on most orders. Unsure of any of the above questions? Simply call us and we will gladly assist you.